On this week’s update: a sponge that cleans up oil, the dogs sniffing out malaria, and “bio-bricks” made with pee! And “bio-bricks” made with pee! First up: when oil leaks out from oil rigs or tankers into the sea, it can be very harmful to the environment. Now, researchers in China have invented a sponge that can remove oil from water. The researchers used chemicals to create tiny holes in a piece of wood, then gave it a special coating that attracts oil. The wood sponge soaks up oil, but not water. It can even be squeezed out and re-used. So far, the sponge has only been tested on a small scale. But one day, it could help to clean up after huge oil spills. Next up, it’s Animal Watch. Mosquitos are known for their nasty bite. But in some parts of the world, they also spread a dangerous disease called malaria. Malaria can be cured, but the first step is to work out if someone’s infected – and that usually requires a blood test. Now, researchers in the UK are developing a new method for sniffing out the disease. Meet Freya, the malaria-detecting dog! The researchers collected socks worn by children – some of whom had malaria – and used them to train dogs to recognise the smell of people who have the disease. In future, Freya and her furry friends could help identify infected people more quickly, so they can get the treatment they need. When you push the flush, you might think you’re getting rid of useless waste. But pee – or urine – is actually a valuable resource! Now, scientists at the University of Cape Town, in South Africa, have found a new way to use this "liquid gold": making bricks! Regular bricks are made from soft clay, which turns hard when it’s baked at high temperatures. That uses a lot of energy. Instead, these “bio-bricks” are made by mixing urine with sand and special bacteria. The bacteria produce a chemical that breaks down urine and creates a hard substance called calcium carbonate, which glues the sand together into a strong brick. This brick doesn’t need to be baked – and that saves energy. So: next time you flush, just think how useful that pee could be! Researchers in China have invented a wooden sponge that could help to clean up after oil spills. Scientists in the UK have trained dogs to recognise the smell of people who have malaria. The dogs could help identify infected people more quickly. A team of scientists in South Africa has created "bio-bricks" using urine. Unlike regular bricks, they do not need to be baked at high temperatures. 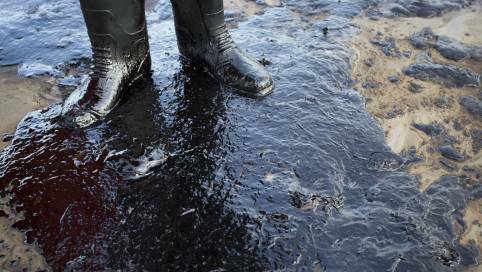 Why is it necessary to try to clean up after oil spills? What are the advantages of using wood to create the sponge, rather than a human-made material? How could the scientists change their sponge design so it works on a large scale – for example, after a real-life oil spill? Why is it important to identify and treat people with malaria quickly? Do you think the dogs can identify for certain whether someone has malaria by sniffing their socks? Why, or why not? What other ways do dogs work with humans to help them tackle challenges? Unlike regular bricks, bio-bricks don’t need to be baked. Why is this an advantage? To make lots of bio-bricks, lots of urine would have to be collected! Why might this be challenging? Can you think of another way a waste product could be used to make something new?